crossovering | 2018 sign ups are open! For more information about requests and offers for this exchange, please continue reading. You're required to make at least 3 requests; you're allowed a maximum of 10. There are five parts to each request. Fandoms (Required): You're required to choose at least 2 fandoms per request; you're allowed a maximum of 10. For one request, you might choose Better Off Ted, Brooklyn Nine-Nine, iZombie, Selfie, and Superstore. If you and your artist/author are matched on this request, that means they offered 2 or more of these fandoms. However, your artist/author is only obligated to cross 2 fandoms, even if they match on more, so please be certain you're happy with any combination of the fandoms in each request. In each request, you may choose 2+ fandoms from one greater canon—for example, you may choose Stargate Atlantis and Stargate SG-1—but you should choose a 3rd fandom outside of that canon. You're allowed to request fandoms more than once, but each of your offers must be unique. In other words, no 2 requests can be identical. You may request up to 10 characters. This field is optional, and we will not use it to match, but it will give your artist or author a better idea of what you like. If there are more than 10 characters you'd like to list, you can list them in your letter. Additional Tags (Required): This field serves two purposes: first, to allow participants to choose between art and fic; second, to allow participants to choose between crossovers and fusions. You will see 4 options: Crossover/Art, Crossover/Fic, Fusion/Art, and Fusion/Fic. You must choose at least 1 of these, but you can choose as many as you like. Letter URL (Optional): You may include a link to a Dear Creator letter, where you can tell your artist/author more about yourself and what you'd like to see in a fic. If you have a serious DNW (i.e. a trigger or something else that would ruin a gift), the letter and the optional details are your place(s) to list that. Please remember that the details in your letter are optional. Your artist/author does not have to incorporate any requests beyond the fandoms you matched on. Make sure the link is unlocked/public so that your artist/author can read it. You can post a link to your letter here. Optional Details (Optional): If you don't want to write a letter, but you'd still like to leave prompts or ideas for your artist/author, this is the place to do it. Again, optional details are optional. We discourage artists/authors from incorporating their recipient's Do Not Wants/dislikes, but they aren't obligated to include all of a recipient's likes. How do I make offers? You're required to make at least 3 offers; you're allowed a maximum of 10. You're required to choose at least 2 fandoms per offer; you're allowed a maximum of 10. In each offer, you may choose 2+ fandoms from one canon—for example, you may choose Stargate Atlantis and Stargate SG-1—but you must choose a 3rd fandom outside of that canon. You're allowed to offer fandoms more than once, but each of your offers must be unique. In other words, no 2 offers can be identical. 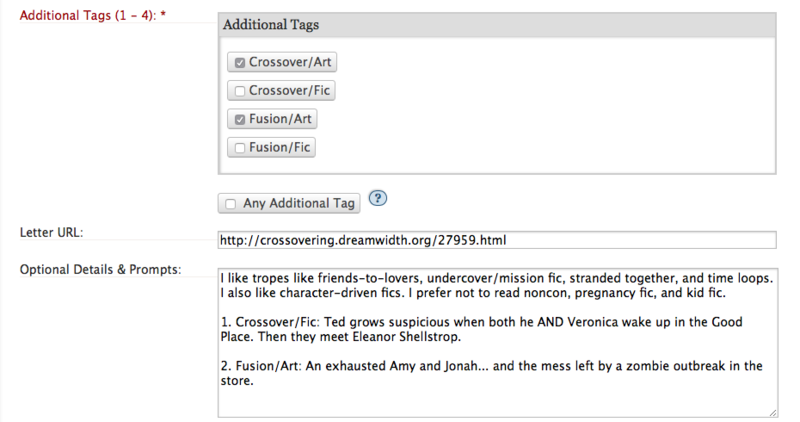 As with requests, you will use the Additional Tags field to choose whether you want to offer art, fic, crossovers, and fusions. For one offer, you might select Allstate Insurance "Mayhem" Commercials, Kitchen Nightmares RPF, and Leverage. If you and your recipient are matched on this offer, that means they requested 2 or more of these fandoms. However, you're only obligated to cross 2 fandoms, even if you match on more. Please be certain you're happy with any combination of the fandoms in each offer. You can view the approved fandom tags for this year's exchange here, but as you can see from the request and offer examples, there will be an expandable checklist of all available fandoms on the sign-up form. Can I change my sign-up? Yes. Until the sign-up period ends, you may edit your requests and offers as often as you like. What's the difference between crossovers and fusions? A crossover is when the characters/worlds of both fandoms interact. For example, Joan Watson and Sherlock Holmes (Elementary) solve a case with Kate Beckett and Richard Castle (Castle). A fusion is when the characters of one fandom are placed into the setting of a second fandom. For example, Joan Watson and Sherlock Holmes are co-pilots in the world of Pacific Rim. In this scenario, the world of Pacific Rim erases Joan and Sherlock's canon history.